A taste of life in Lagos and Nigeria. Today, I am going to start a new series on what in my opinion constitutes ‘the 7 wonders of Nigeria’. I have no doubt that my list will differ from yours; what will be interesting is to find out what you consider as the 7 wonders of Nigeria and why. Please use the comments link on this blog to air your opinion and enrich the discussion. Happy reading! Okada is a creation of necessity. 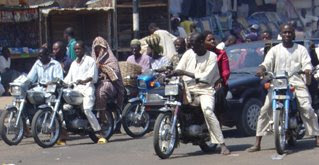 Unlike the Chinese that have established the motorcyle as a means of transportation, Nigeria is not as populous to adopt this as a permanent form of transportation. We used to travel on taxis and buses in the major cities. We would easily prefer these means of travel; however, Okada surreptitiously crept into the Nigerian vocabulary and also into our carriage system as the economy bit harder in the 90s. The name Okada was adopted from a small town in Edo State. Now almost everywhere in Nigeria, Okada is the fastest means of transport and a very big headache for that matter for motorists and other road users. They meander dangerously through traffic, they don’t obey any traffic regulations and anyone can put a bike on the road, with no training or registration required. They wear no helmets and offer their passengers none. Okada drivers are either deliberately inviting motorists to hit them and their passengers (they often carry two or more people) or they believe they are invincible. Sadly, it is said that a wing of the orthopaedic hospital in Lagos is set aside for victims of Okada accidents. Although many would not admit to it, a good number of Nigerians, rich and poor would have had to take an Okada at a desperate moment for only Okadas can whiz through the depressing and parking-lot traffic of Lagos to deliver you to the multi-billion Naira corporate deal less than three miles away. An American Christian leader who is also the Editor of 'Charisma Magazine' wrote an insightful piece in 2007 on how he had to abandon his comfortable car to ride on the back of Okada to make a preaching engagement in Lagos. Okada has become a legacy of our economic and political failures. The argument for Okada by its proponents is that it provides a quick and effective means of transportation for a vast majority of our people, and employment for those who might otherwise go into the underworld. However, the question is ‘do we as a nation really want an Okada economy’? For its pervasiveness as a form of transport all over the country, Okada, the motorbike taxi is a wonder of Nigeria. Nigeria is the most unique nation on earth. PERIOD. I moved back to Nigeria lock, stock and barrel recently after living in England for well over a decade. This blog showcases my experience and it is often written with a slightly positive tweak. This is Lagos. This is Nigeria. What's your description of the Nigerian Woman? 'The 7 Wonders of Nigeria' - Which in your opinion should make the list? Which is the most important factor in deciding to move to Nigeria? Would you consider moving to Nigeria?